How much would you pay if you had all the money in the world and you wanted to buy the most expensive and luxurious bed out there? Would you pay $6 million for a bed? Well, believe it or not, there are 2 people that actually paid this much for the Baldacchino Supreme, the most expensive bed in the world. The identities of the buyers are kept secret for obvious reasons. The Baldacchino Supreme is the work of Stuart Hughes, a really well-known designer. You may know him because of the gold house he created. 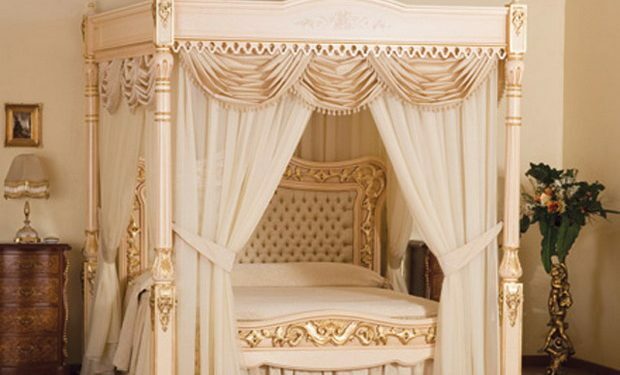 He teamed up with Hebanon and created this masterpiece, a luxurious bed that is completely handmade and includes 107 kilograms of 24 carat gold. You will instantly notice the gold in the decorative applications that are clearly seen in the images below. The main structure of the bed is made out of chestnut wood in a combination with curving ash wood. The canopy has edges made out of cherry wood. The finest cotton and Italian silk in the world was added to create a completely royal experience. Baldacchino Supreme is really exclusive and everything can be customized based on the indications of the client. However, if people are willing to pay so much for this bed, they will, most likely, choose the option that is seen in the pictures.